Instacart delivers to parts of Dorchester, but not 02124— where the mayor lives— or Mattapan.On-demand delivery services are popping up and expanding all over Boston in what some economists call “the Uber economy.” Need an extra case of beer for the game? Touch your smart-phone screen on the Drizly app and it’ll be at your door in under an hour. Forget to stop at CVS for the diapers and baby wipes? No problem! Instacart, Favor, or Postmates will be there before that last Huggies becomes a hazmat situation. Babysitter canceled on date night? Just hit-up Caviar or Dining-In and they’ll bring that gourmet meal to you! Unless, that is, you live in Dorchester or Mattapan. A review by the Reporter of the most popular delivery apps that claim to serve “Boston” found that many leading brands do not serve customers in Dorchester or Mattapan, even as some of their rivals are making inroads into the neighborhoods. While some claim they will get here eventually, they are hard pressed to explain why the city’s largest neighborhood— with an increasingly diverse mix of people and incomes— is getting shut out. Joel Richards, a 32-year-old school teacher who moved to Ashmont from Somerville two years ago, agrees. He has been pushing companies like Instacart — which does deliver to 02125 and 02122, but not 02124 or Mattapan’s 02126— for an explanation. It’s not just newcomers who’ve taken notice of the digital delivery diss. 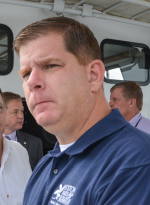 One high profile OFD resident who’s peeved by the slight is Mayor Marty Walsh, whose Lower Mills home is also not serviced by some of the most well-known outfits. Some companies polled by the Reporter insist they plan to expand into the neighborhood, but most remain vague on the timeframe. Postmates, another “we’ll bring you anything” start-up, claims Boston as its turf, but doesn’t do Dorchester “yet.” April Conyers, a company spokesperson said Dorchester “is on the list for when we expand in Boston,” but she could not offer a specific time-frame. 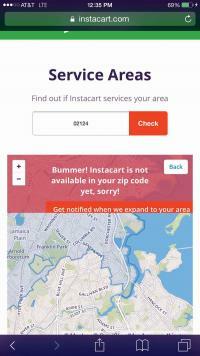 Instacart, which brings “groceries to your door in one hour,” is making inroads into Dorchester, although they do not yet offer service to the 02124 zip code or Mattapan. Sophie Kleinert of Instacart explained that the company uses data from user requests at its website to help navigate their expansion plan. “When customers sign up online, we’re able to measure interest in a specific market and take that into account when we’re thinking about new areas to cover,” Kleinert said. Drizly, the company that promises to bring beer, wine and spirits to your home, has one of the largest advertising campaigns right now in the Boston market. Red Line passengers commuting to and from Dorchester and Mattapan see the advertisements, but they can’t get the service yet. Drizly works by partnering with brick-and-mortar retailers to serve customers through their easy to use app. In responding to an inquiry from the Reporter last week, the company said that it is in talks with the Dorchester-based Supreme Liquors to be its Dorchester distributor. A deal might be in place before the end of the first quarter. There are a few on-demand companies that are serving Dorchester and Mattapan. Delivery.com, Seamless, GrubHub and Doordash offer deliveries to those neighborhoods, and it’s likely that more will eventually beat a path to our doors. This past week MealPass (like ClassPass but for lunch) launched in downtown Boston. And still others, such as UberEats and Munchery, which are currently doing well in other cities across the country, are on the verge of expanding to Boston.